Work has commenced on the construction of a second mast at Emley Moor, heralding changes to Yorkshire's Freeview TV service. A second mast is required to ensure that households in most of Yorkshire can continue receiving Freeview in the coming years, while work to change broadcast antennae on the main mast takes place. 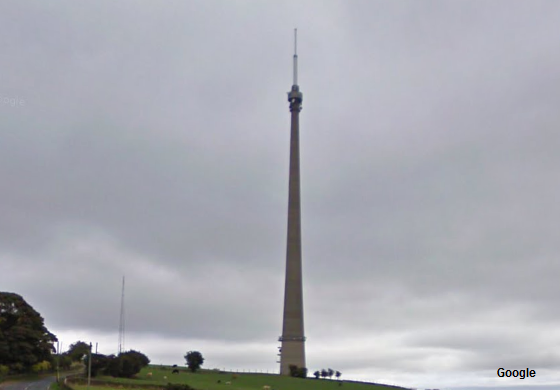 At the same time, the height of the Emley Moor mast will be reduced by eleven metres, from 330 to 319 metres, as redundant antennae are removed. According to the Huddersfield Examiner, construction of the constructors' compound and access tracks this week marks the start of the work which will culminate in the construction of the mast, which is owned by broadcast infrastructure company Arqiva. Following a public consultation last year, permission has been granted to erect a 317 metre high temporary mast next to the current site for the benefit of the 1.7 million homes in Emley Moor's coverage area. The work is needed due to Ofcom-mandated changes to frequencies in the 700MHz band, currently used by Freeview. The 700MHz band is to be cleared in the coming years to make way for new 5G mobile services. Emley Moor is particularly affected as it transmits a number of services in that band. The schedule for the changes is still being finalised, and is reliant on good summer weather. It's expected that once the next mast is in place and ready to start broadcasting, there will be short periods of interruption as broadcast services are transferred to the new mast. Ofcom currently advise that viewers in Yorkshire will see a reconfiguration of their Freeview service during the first part of 2020. At that points, households will need be required to retune all devices. The current Freeview service from Emley Moor, consisting of eight national multiplexes will be consolidated into six national multiplexes. The local TV multiplex, broadcasting the local channel for Leeds, Made in Leeds, will also be reassigned to a new frequency by 2020. On completion of the changes, Freeview broadcasts will be returned to the refurbished original mast. Arqiva expects the temporary mast to be removed by the end of 2021, allowing extra time in the event of bad weather.